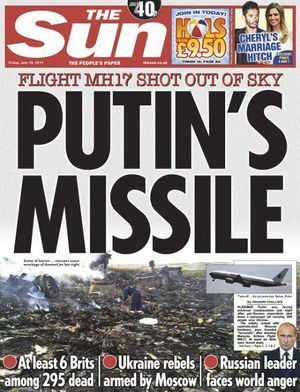 Russia airs conspiracy theories over MH17 tragedy Compilation of Russian newspaper stories and claims - second jet, Putin's plane, surface-to-air, air-to-air, etc. The stretch of the flight route of the Boeing 777 airliner of Malaysia Airlines and the site of its crash were within the zone of operation of two Ukrainian batteries of the S-200 long-range anti-aircraft missile system and three squadrons of the Buk-M1 medium-range anti-aircraft missile system, the press service of the Russian Defense Ministry told ITAR-TASS on Friday. The ministry stressed that technical features of the Buk-M1 air defense system allow it to exchange information between the squadrons of one battalion. “Thus, the launch of the missiles could also be made from all the squadrons, located in the Avdeyevka settlement (8 km north of Donetsk) or in Gruzsko-Zaryanskoye (25 km east of Donetsk),” Russian Defense Ministry stressed. Witness testimony. A BBC Russia report, which was deleted by the BBC after it was published, but stayed available on youtube and was widely discussed on the internet, was republished after two days with a justification pointing to technicalities and mentioning "a lot of comments" they received over the deletion. It provides significant witness testimony from local inhabitants taken soon after the event that low (and apparently slow) flying military planes were seen in the area at the time of the accident; some hand waving gestures were made by witnesses suggesting from where and to where those planes were flying. Loud bangs, apparently two, were heard by the witnesses. But no striking trail (like Buk launch) was reported by those witnesses. Not only such a report SHOULD NOT be buried, but it should be properly filed with the police in the Netherlands leading the official investigation. Relevant materials can be uploaded online. Exact location, timing, altitude, speed, and directions would be hard for non-expert to determine. Eyewitness reports appeared credible. There appeared to be several independent but consistent reports pointing to low-flying planes, not a single report. Another witness report appeared to be made by rebel leader Bezler, as reported in the SBU intercept posted on youtube and widely discussed. While the posted intercept appeared to consist from glued together independent bits, those individual bits appear to be not denied by the rebels as not being genuine. One bit, where "Bezler" heard saying to "X" that a plane was shot down at Chernukhino , appears to be a single bit which is disconnected from the other parts of the recording. Exact time of this part of intercepted statement cannot be verified from analysis of youtube video , but the video was posted and discussed shortly after the event. Lev Aleksandrovich – MH17 eyewitness -Max van der Werff interview, posted May 30, 2015 (talk). Labusov is a Donetsk native ex-SBU officer who changed sides (as civilians are regularly shelled in ATO, etc). He says that there was no proper MH17 investigation, rather a dossier was collected to support the conclusion placing blame on the pro-Russian side. -He has not seen documents establishing who is actually to blame. Netherlands ‘has all US information’ on MH17: investigator, quoting AFP (other reports quote DW), Mar. 8, 2016. Details on 'information' were not provided. “Regarding the debate which still exists over the sharing of information from the United States: all information which is available and which is of interest for the investigation has been shared,” said Fred Westerbeke, chief investigator in the criminal investigation. He reiterated that they expected this summer to determine the exact location where the missile which downed the Boeing 777 was fired from and the precise model used. Ukrainian SU 25 shot down. Another SU 25 damaged. Conflicting dating (16 or 17 of July). Footage of shooting may appear in Odessa 1 TV footage, 17 July. MH17 Crash time is 16:20, local time (13:20 UTC, 17:20 Moscow time, 09:20 EST). Moscow time is 1 hour ahead of the local time. Burning wreckage video. 20:30 Moscow time, Kremlin "The Russian leader informed the US President on the report of (Russian) air traffic control services (received right before the telephone conversation) about the crash of the Malaysian plane". (White house read-out);(new report). Ukrainian Buk reports: TASS, 17 July 19:55 Moscow time It is reported that on 16 of July Ukraine brought Buks to Donetsk region. Ukrainian Buk sighting: 16 July 2014, Evening News, "Час Ч" №129 Program, Ukraine. Separatists Buk sightings: none confirmed. Plume-of-smoke-on-a-sunny-afternoon photo , as well as 'Torez sighting at 12:00 ' photo, appeared in Gerashenko Facebook post on 17 of July. 17 July,10:38 PM EST. White House Press Release. "While we do not yet have all the facts, we do know that this incident occurred in the context of a crisis in Ukraine that is fueled by Russian support for the separatists, including through arms, materiel, and training". 20 July, John Kerry interview, CBS news. Secretary of State John Kerry made the rounds on the talk show circuit Sunday confirming the U.S. has “evidence” to conclude that Russia provided separatists in Eastern Ukraine with the weapons used to shoot down the Malaysia Airlines jet. At 46 minutes there is a closeup of the cockpit. First minutes after crash published in KP , 16 November 2014. Villages in attendance, one utters "rocket" (referring to the cause), no further usable audio info. People in Torez stare at the sky, point to what may be smoke trails. 30 seconds later a dark plume from the crash appears in the horizon. Shows BUK TELAR moving south from Snezhnoye. Few minutes before the accident, eyewitnesses saw another (military) plane , Channel 1, Russia, dated 17 July 2014, 22:07 (Moscow) according to the time shown on the web page. Announcer: Few minutes before the accident, eyewitness saw another military plane, according to RIA Novosti reports. And now, Alexandr Evstigneev reports from the scene on the phone. "Representatives from oplochenie confirmed that they found 8 out of 12 on-board recorders, the so-called black boxes. I remind (earlier report, 21:03 Moscow Time) that opolchenie representatives suggested the following hypothesis: a Ukrainian fighter, a SU plane, shot down a passenger plane not near Snezhnoe. After this, this military plane was shot down by opolchenie. It is not known whether the pilot was found, or whether he parachuted to safety. If he is found, he will be a key witness". We see footage of burning wreckage, firefighter at work, passengers' passports, etc. 21:03 report gives panoramic view of burning plane from a distance; no missile trails (or planes) can be seen in that footage. Few minutes before the accident, eyewitnesses saw another plane, Channel 1, Russia, dated 17 July 2014, 22:45 (Moscow) according to the time shown on the web page. Footage shows two witnesses, said to be from Grabovo. First, audio recording of a lady, 'Tatiana' , over the phone, from Donetsk region, Ukraine. She heard sound of two planes, than 2 or 3 explosions. When she went outside, she says "one plane was burning behind some trees", another was "flying away" , She than repeats, explaining there were 3 (or 2) explosions in the air (she initially thought it was bombing, but it was not), and than one plane "fell down, and was burning", another flew "to the other side, towards Dnepropetrovsk" . Second witness (video of a male). It starts with "before that, there was some shooting in the air, several shots" , than "a loud bang, as if really close" . Then he saw a plane emerging from the clouds and falling apart. In the clip we are given, he does not explicitly mention a second plane (but this is suggested by 'shooting' prior to 'loud bang'). This appears to be the earliest recorded witness claim. Web page has photos showing smoking wreckage, and a firefighter next to the wreckage. 17.07. 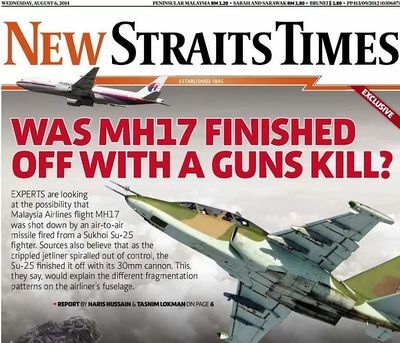 Anton Gerashenko makes several Facebook posts claiming that MH17 was shot by rebels using Buk. (1) He posts a crash video, and claims that the rebels shot the plain using Buk provided by Putin. (3) Posts photo claimed to show 'Buk trail' (the lots-of-sunlight-and-plume photo), which he says "was made several minutes after Buk launch, in the 3 microdistrict of Torez, 'from the West to the East, seen by thousands of people', and claims that " we determined that terrorists were in possession of "Buk" which was documented (зафиксирован) by us in the area of Torez and Snezhoe cities. (5) Posts a photo showing "Buk in Torez"
Gerashenko is quoted in Odessa 1 TV footage at 21:00 Ukrainian time (22:00 Moscow time), blaming separatists. That is followed by a report on Ukrainian plane shot by a "Russian plane", pilot bailed out an was rescued; exact date/time/place of that event is not provided. Russian Channel 1 TV corresponded in Kiev makes her report on the Buk claim, quoting Ukrainian TV channels, dated 17 July 2014, 23:30 (Moscow) according to the time shown on the web page. Here, a downed Malaysian aircraft is a fatal accident. But I can say that at that moment when Poroshenko was informed (he was sitting on the National Security Council of Ukraine’s defense), they brought him a message that the plane was shot down, he crossed himself and said: “Thank God, Ukraine has been saved". A.Venediktov - This is true, yes? V.Solovey - Absolute truth. Well, maybe Mr. Poroshenko will confirm this fact over time. High quality photos of wreckage, including critical images of (rod) warhead damage to left wing. Photo album was posted on 19.10.14, apparently originated from someone living in the area. This photo from the album apparently shows pilot seat, with incoming shrapnel apparently from the left. There are many other photos as well. Photos from hangar where MH17 is being reassembled. mh17.webtalk.ru, various suspected additional parts, and possibly missile fragments (unconfirmed) photographed at various times near crash site, 20 October 2015, with updates 13, 29 July, 16 August 2015 and 11 Sept 2016. The latter includes burned out chip board (photos Q18-Q27), with Russian language electronic components (that would be the same on Russian or Ukrainian equipment made in Soviet era). Photo Q23 appears to be operational amplifier 153УД1, seen here (Riga, Latvia company site), of broad use. Q24 is a resistor, 10 or 1.0 kOhm, exact match cannot be found, but of very broad use, Russian style marking. Altogether what remains from the chip weights about 79 grams. This is followed (up to photo Q41) by photos of unknown fragment from rough metal, green paint, no rust but rough surface, sizes about 19 x 11 cm and 5 mm thickness, 161 g weight, reported to be not magnetic apart from the nut and bolt. Earlier same source reported a metal fragment of weight 4.3 g, apparently non-magnetic (photos C027, C028), about 6 mm thickness, shiny metallic color on fresh surface made with a file tool (photo C026). Had a door photograph earlier, too. (Authenticity and origin of all those photos are unconfirmed; the author is unknown. In particular chip is not clearly linked with a missile which downed MH17 and could come from, e.g., a downed drone, or a different missile, etc ). Instead of presenting hastily doctored evidence to the international community, the SBU could do with better control over all the mercenary units in the areas around Donetsk and Lugansk organized by Kolomoisky, Lyashko, Yarosh and others, who shell Ukrainian territory without any control from those in charge of the anti-terrorist operation. The images, which Kiev claims were taken by its satellites at the same time as those taken by Russian satellites, are neither Ukrainian nor authentic, according to Moscow's statement. As explained here on the discussion page, this is a humorous way of pointing out Ukraine has no satellites, so this must have been provided by someone else. ... the real owners of those photos are hesitating to publish them under their own name, since it would derail the myth of the omniscience of their space reconnaissance,” the Russian ministry said. It also simply might conflict with what the Ukrainians did with the images after they were released to them, but not to the global public. Earlier analysis of the same author showed many interesting details of damage (e.g. rivets broken before small metal particles deposited; some evidence of heat exposure outside of fire on the ground; some apparent bending outside in central and cabin areas). However overall conclusion at the very end (several explosions on board and no external hits) appears wrong. Families of three German victims sue Ukraine Government over failure to close the airspace. The mother of the victim named as "Olga L." was seeking $1 million in compensation from Kiev for manslaughter by negligence and had begun proceedings [at the European Court of Human Rights] in the past week, Bild am Sonntag newspaper said on Sunday. This page was last edited on 22 February 2019, at 06:07.